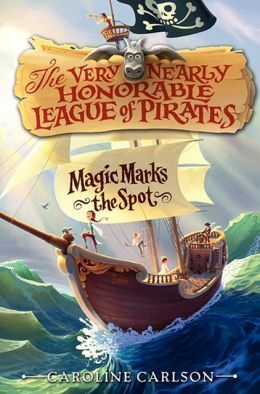 This first book of a new series about pirates is absolutely charming. While the pirates consider themselves very seriously they are far from fearsome. The story has everything a good pirate tale is expected to contain: grog, swords, treasures, ships, peg legs and eye patches. It even has more than normal with the inclusion of magic, a boarding school and a girl who will only ever and always become a pirate. Fourth grade readers, fifth grade readers and beyond will enjoy reading this independently while third graders will enjoy hearing it as a read aloud. Many literacy skills can be reinforced in large or small group settings while reading this book, including but not limited to: cause and effect, inference, following clues, use of humor and letter writing skills. For a more informal enjoyable experience, it would be a great book club choice for friends to share and discuss. Interspersed in the story are letters of surprising formality and comic use of everyday phrases between pirates, the head mistress of a girls’ finishing school and the main character. There are also supposed clips from the Pirates Guide Book, local newspapers and want ads. It is a completely enjoyable book. Readers will be looking for the sequel even before they finish this one.